If its not broken it soon will be! I am looking to replace my Pillowball bushes and while trying to find the best deal I can I have come across a company called Hardrace that do a full kit at a good price, So I was just wondering if anybody had any experience of these and if so were they ok ? 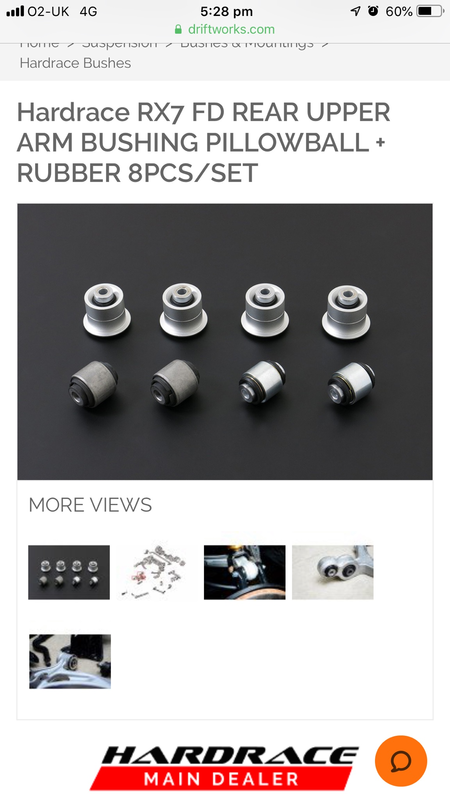 Price is about the same as oem.....i have no experience of Hardrace have a similiar issue with rear toe arms. Luckily a cheap bush not a pillow ball. I did mine 3 years ago oem and car gets track use the oems have lasted so far. Id be inclined to get an upto date price from Clive on oem. Blimey, i dont remember them being that pricey. Yeah they are crazy do those ones in the link look like the right ones?